We’ve been following UK-based startup Screenreach Interactive for some time now, and back in April we reported on its deal to take its technology to 800 coffee shops across the USA, whilst in August we reported on its partnership with Bauer Media to bring location-based content to radio apps. Screenreach was launched in Summer 2010, and its main interactive product is the Screach app, an interactive digital media platform that allows anyone to create real-time, two way interactive experiences between a smart device (through the Screach app) and content on other platforms, or just within the mobile device itself. The technology is accessed through the Screach application or by embedding the Screach software developer kit (SDK). 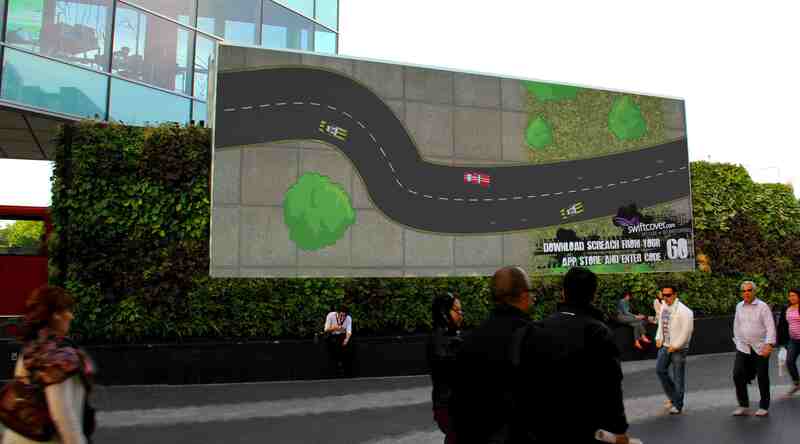 Screenreach has now teamed up with Ocean Outdoor, a UK ‘out-of-home’ advertising company, focusing on large format digital screens, banner and landmark advertising sites, to deliver a pretty cool marketing initiative for insurance provider Swiftcover. From tomorrow, 12th of October, visitors to Westfield Shopping Centre in London’s White City area, will be able to play an interactive, multiplayer driving game. The game allows drivers to compete against each other using the Screach app (iOS, Android and BlackBerry), and it’s motion-controlled, triggering the user’s on-screen car when a steering motion is made with the mobile device. Shoppers can interact with the game by downloading the Screach app and entering code ‘60’ into the keypad. Their device then turns into a controller for the driving game. 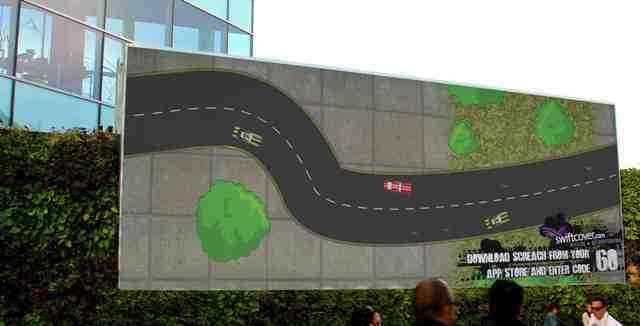 Gamers can select from a number of car models and colours before making their way along the race route, competing against other users. Called the 60 Second Challenge, the drive simulates America’s Route 66, allowing users to collect swiftcover.com tokens along the way. What’s even more interesting is that users can connect to the app through Facebook, and have their Facebook profile picture featured on the screen, as well as post news of their activity to their Facebook profile. Of course, the profiling features will also enable Swiftcover to glean more information from consumers and how they’re interacting with the brand.